Maybe you'll like it, or, maybe—like me—you'll just be caught flat-footed. I thought it was about the tennis match, and overcoming chauvinism. It's a romantic love story with lots of experimental snogging. On a happier note, Elizabeth Shue is phenomenal as Bobby Riggs' long-suffering wife, Priscilla. She's not in it much, but she steals every scene she's in, and understatedly. She's so classy. What a long, beautiful journey it's been for Shue. She's come a long way since 1984's The Karate Kid and 1988's Cocktail, and that's an example worth following. She just flat out does. 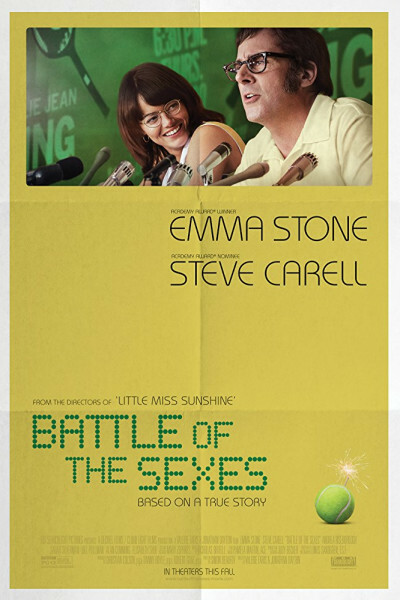 IMDB has Battle of the Sexes at 6.5, and that's generous. I was really excited about it so, for me, it's a huge letdown. Onward to Blade Runner 2049.